This is a screen shot I took a couple days ago. 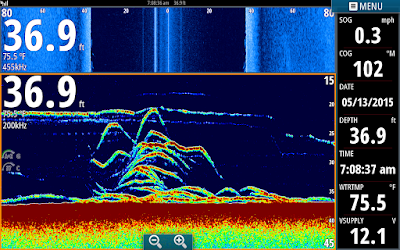 I am on a 80 foot side scan scale [80 feet to the left and right] and a 45 foot scale on my echo [sonar] window.You can see Stripers both on side scan [small vertical dashes] and as yellow and red arches on my echo window. I have adjusted my splits between the screens to have more of a size window on the sonar than the side scan. That way I can see the echo's of the Stripers a little better. In this pic I customized my depths on my echo page to an upper limit of 15 feet. By doing so I can eliminate the upper water column which no fish are in and see the fish much more clearly. About halfway through the shot you can see us making 2 foot pulls lowering a bait down into the school then getting clobered by a Striper. These fish were not feeding until I put the bait in their faces then they started to get excited and started streaking. We had some fun with this school. 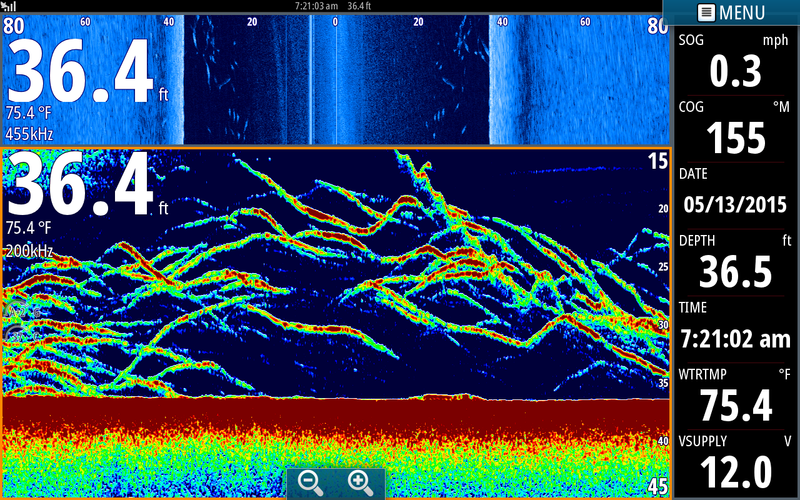 Here are some dormant Stripers not feeding. 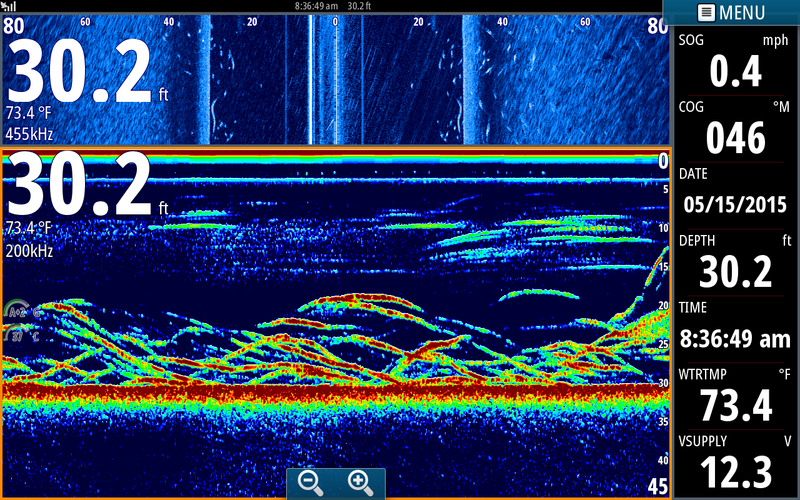 The colorful horizontal lineis my sinker and the light line under it is the bait. As you can see I lowered bait from 22 feet down to 28 feet in hopes of inciting a strike. Come to find out after not being bit that our bait was dead. No wonder we didn't get bit! Notice this was just a small pod of Stripers, nothing showing up on side scan. Within a few minutes I did see some Stripers on side scan, went to them and started catching them as can be seen in the picture above this one.